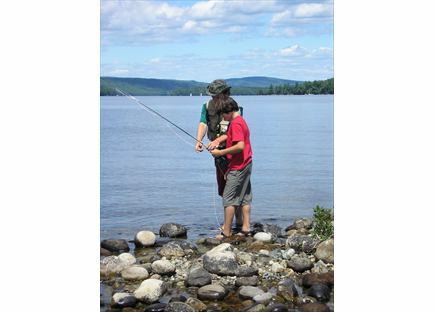 Great Pond is one of Maine's premier smallmouth bass fishing lakes, a perfect place for boys to learn to fish both with spinning gear and with fly rods. Fly fishing is offered as a full-fledged activity at Pine Island with a counselor dedicated to it. The camp owns a number of fly rods and reels and all the gear necessary for tying flies. During a typical fly fishing activity boys can learn the basics of fly casting or fly tying. Many boys have caught big bass on flies they have tied themselves.